Climate change can seem abstract and distant, but an exceptionally warm day in Massachusetts can really bring the point home. And there have been plenty of scorchers recorded in recent years at the Blue Hill Observatory in Milton. 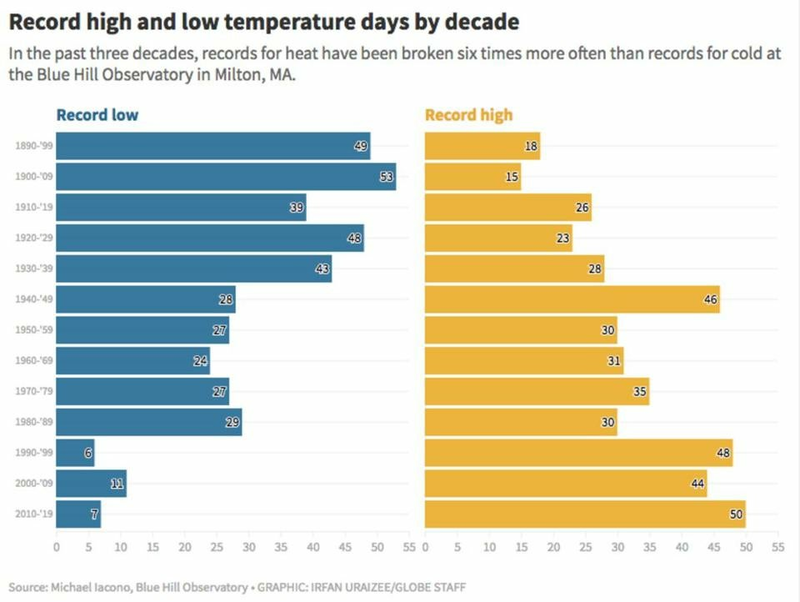 Over the past three decades, there have been nearly six times as many daily records for heat as daily records for cold broken at the weather observatory south of Boston, observatory officials said. If the climate was not changing, the number of records broken on the high and low side would be expected to stay about the same. A daily record is the highest or lowest temperature ever recorded on a particular day of the year. From 1990 to the present, 142 daily records for high temperatures were broken at Blue Hill, while only 24 records for cold were broken, Iacono said. That’s 5.9 times as many heat records as cold records. The records go back to 1885. A recent review by the Associated Press of daily temperature records set at 424 weather stations across the United States for a different time span — from 1920 till today — also found hot-temperature records significantly outpacing cold-temperature records in recent decades. ‘‘We are in a period of sustained and significant warming and — over the long run — will continue to explore and break the warm end of the spectrum much more than the cold end,’’ National Oceanic and Atmospheric Administration climate monitoring chief Deke Arndt told the AP. 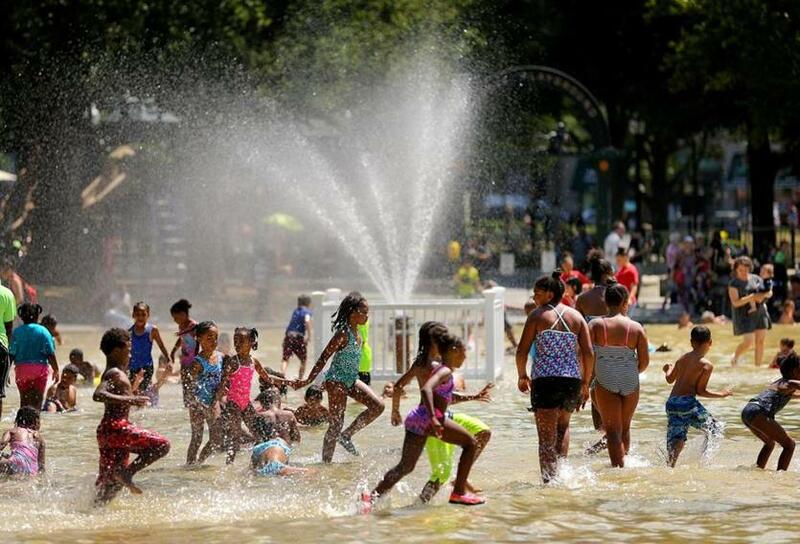 With temperatures on the rise, we all may need to cool off like this on summer days in the Frog Pond in Boston Common. While scientists often talk about average temperatures, it’s the extreme days that send people to the hospital, wither crops, and raise energy bills. The AP, in its research, found one place where the trend was startlingly clear: the Southern California city of Pasadena, where 7,203 days (more than 19 years) went by between cold records being broken. On Feb. 23, Pasadena set a low temperature record (17 degrees), its first since June 5, 1999. In between the two cold record days, Pasadena set 145 hot records. That included an all-time high of 113 degrees last year. Iacono noted that the warming could also be seen locally in the decrease in how long ponds remain frozen in the winter and the earlier blossoming of local plants, including blueberries on the summit of Great Blue Hill, where the observatory is located. 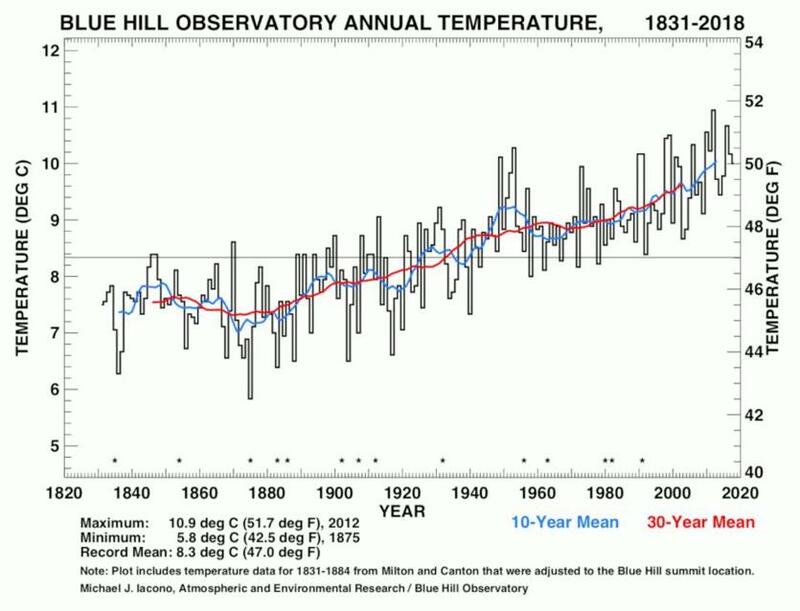 Don McCasland, program director at the observatory, said average annual temperature is warming at Blue Hill much faster than in the past. Temperatures rose less than 1 degree from 1820 to 1919, but just over 2 degrees from 1920 to 2019. “That is 3 degrees warmer in two centuries,” he said, “and that is a large increase in a short amount of time. “There are many things that should bring the issue home to people,” he said, including reports of sea level rise, extreme weather events, and temperature and other “records from around the world showing very similar trends. “One weather event is not an indicator of climate change,” but the “aggregate information” shows climate change is real, he said. Annual temperature figures from Blue Hill tell a similar story. Nine of the world’s 10 warmest years have occurred since 2005, with 2014-2018 ranking as the five warmest years on record, according to the National Oceanic and Atmospheric Administration.